1. Despite the fact that Tony loved going to "the spook house!" (the local Halloween store) all throughout the month of October, picked out his own costume, and was crazy excited to go trick-or-treating, he balked yesterday morning when Will and I tried to dress him in his costume for Big Boy School. "No costume! Tony take off!" I had to bribe the little stinker with a chocolate chip cookie, just so we could get out the door in time. Interestingly enough, once we actually got Tony in his costume, he didn't want to take it off for the rest of the day. Go figure. 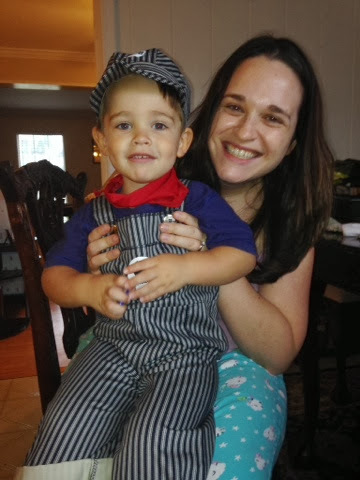 Possibly the cutest train conductor in existence! 2. If you were thinking, "early trick-or-treating at Big Boy School + excitement over the holiday + child high on sugar = nap time fail," you would be right on the money. Both of my children failed to nap yesterday afternoon, which made dinner time VERY...interesting. Let's go with interesting. 3. Given her crankiness over the lack of a nap, Alessandra's costume was very appropriate. 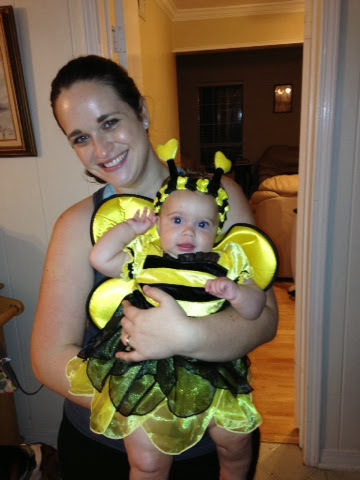 Buzzz buzzz buzzz....our chunky little bee was very confused with her costume. 4. Once again, I'm disappointed to report that trick-or-treating in our neighborhood was a big fat fail. We had *maybe* two costumed kiddos stop by our house (naturally, which means we have a ridiculous amount of leftover candy), and all of our neighbors kept saying that we were the only ones to ring their doorbells in search of candy this year. Boo. Lame. 6. If you were beginning to get concerned that Murphy wasn't involved in the birthday/Halloween festivities, rest assured he didn't forget to give me a special present. I had the honor of sweeping up the remnants of freshly-baked whole wheat bread, which I had made a few hours earlier. Murphy snatched the loaf off the counter while I was upstairs with Tony and Alessandra, and he ate almost 2/3 of it. I was not pleased.